Today, magnetic door locks enhance the security of many businesses both large and small. When you require the installation, repair or maintenance of these specialized locks, contact Ontario Door Repair. Our company dispatches expert local technicians to provide comprehensive mobile locksmith services. Doors can use electromagnetic locks, which consists of a plate that is attached to the door frame and a magnetic plate that is installed on the door. When the two components connect, the door is locked. 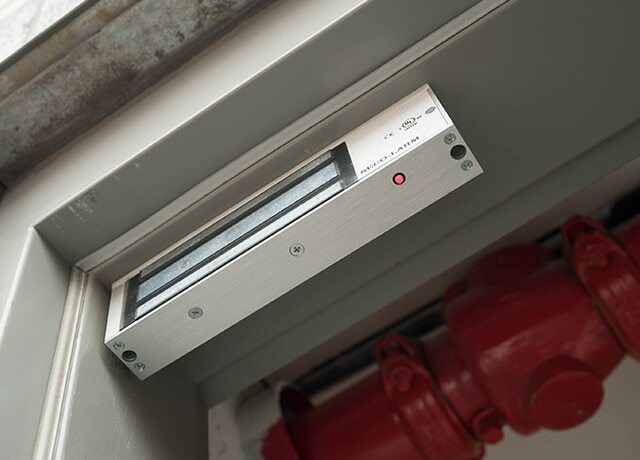 Magnetic locks provide immediate hands-free release when it is contacted remotely from a keyless access control system. Magnetic locks are a good choice when emergency exits are required. Why Choose Ontario Door Repair Our commitment. We hold every interaction with every customer to the highest standard. We are extremely proud of our repeat business and utmost level of customer satisfaction. We all have the same needs, so you can rest assured that the quality of security system work Ontario Door Repair provides to you will leave you feeling safe in your home and business. Contact us for information on a state-of-the-art keyless access system. Ontario Door Repair proudly serves customers throughout GTA, including in Toronto, Mississauga, Scarborough, Richmond Hill, Vaughan, Waterloo, Kitchener, Guelph, Cambridge, Hamilton and Burlington Ontario area.